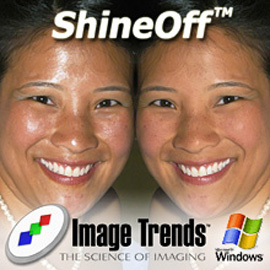 ShineOff is an Adobe Photoshop compatible Plug-In filter that automatically removes the shine from skin. The head-on cold white of flash accentuates an unnatural shininess to skin. ShineOff will automatically restore faces to a soft, dry texture, like you and your clients remember them with no adverse effects. ShineOff can be run on individual images or in a batch mode. ...... This patented technology does not remove luster from the lips nor the sparkle from the teeth or eyes. ShineOff can be run on individual images or in a batch mode. It can also be combined with other Plug-Ins in a script form and applied to a set of images. Qweas is providing links to ShineOff 2.1.4 as a courtesy, and makes no representations regarding ShineOff or any other applications or any information related thereto. Any questions, complaints or claims regarding this application ShineOff 2.1.4 must be directed to the appropriate software vendor. You may click the publisher link of ShineOff on the top of this page to get more details about the vendor.